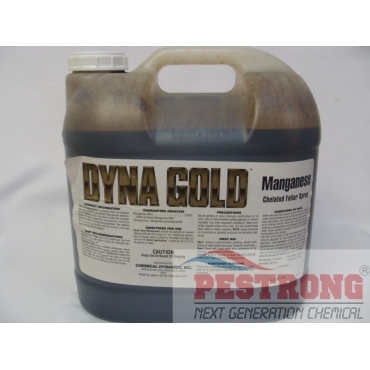 Where to Buy Dyna Gold Manganese, Dyna Gold Chelated Manganese 5% Liquid Fertilizer - 2.5 Gallons - $69.95 for Sale with Fast Free Shipping! Dyna Gold Chelated Manganese 5% Liquid Fertilizer - 2.5 Gallons is a liquid foliar formulation designed to correct and prevent manganese deficiencies in vegetable crops. Citrus and Fruit Crops: Apply 1 to 2 quarts per acre in enough water to cover. Repeat as necessary. Vegetable Crops: (Beans, cabbage, cantaloupe, celery, cucumber, eggplant, endive, lettuce, greens, peas, melons, pepper, potatoes, squash, strawberries, sweet corn and tomatoes) Apply 1 to 2 quarts per acre in weekly applications as needed up to first harvest in enough water to cover. We, Pestrong.com may ship any kind of brand chelated manganese 5% depends on current stock. Mix this with water as per the directions on the label and then apply it to whatever plants that are in need of the manganese. The 2.5 gallons means that I'll have alot of it leftover to use whenever I need it again.